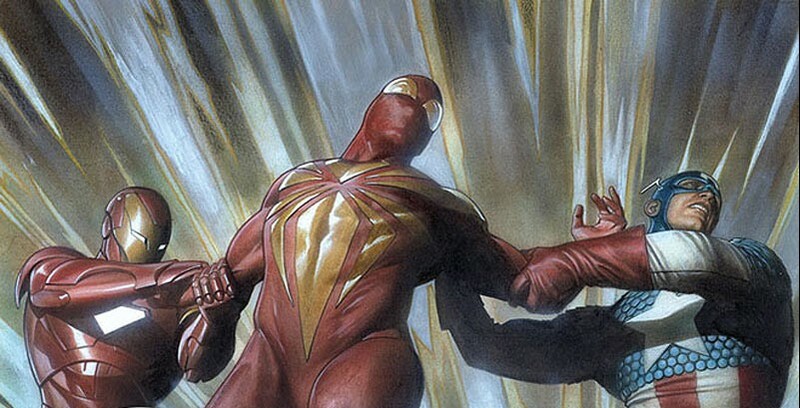 Does the Iron Spider Suit Appear in ‘Captain America: Civil War’? One of the turning points in Marvel Comics Civil War storyline is when Peter Parker embraces the Superhero Registration Act and Tony Stark makes him a Spider-Man suit incorporated with Iron Man tech. Parker later abandons this outfit for the classic blue-and-red when he joins up with Captain America’s team. Ever since it was announced that Spider-Man would be Team Iron in Captain America: Civil War, fans wondered whether or not we’d see the “Iron Spider” suit in the Marvel Cinematic Universe. Latino Review has sources that say that we won’t see the Iron Spider in Civil War, but Tony Stark still has some influence over the tech Spidey uses. Apparently Tony Stark will create web-shooters for Peter Parker, helping him to embrace his arachnid side. When we meet this incarnation of Spider-Man it’s being reported that he won’t have anything other than the costume he made at home. This makes more sense than the web shooters from the last two Amazing Spider-Man films. Did they want us to believe that somehow a broke teenager could afford that much industrial-grade military-issue tactile, tensile “rope”? …and that he can afford to tweak them after they get burnt out from repeated shockings over and over and over until he gets it just right to beat Electro? This would definitely go a long way into helping the wall crawler decide which side he wants to be on when it comes time to choose in Captain America: Civil War, when the film hits theaters next May. This entry was posted in Breaking News, Film, Marvel and tagged Captain America: Civil War, Marvel, MCU, Spider-Man. Bookmark the permalink.